7.5x7.5 inch mixed media acrylic & paper on wood panel. Click here to buy original. 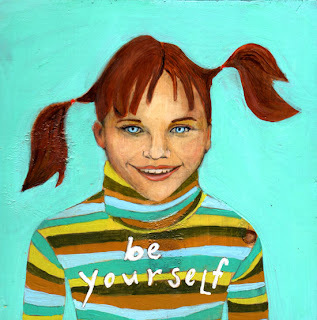 "Be Yourself" 7.5x7.5 inch original acrylic painting on wood. This is a new piece I finished today. It's a bit of a departure from my usual mixed media work, but I had the phrase "be yourself" running through my mind (I swear my paintings these days are probably more influenced by Nogin than anything else! ), so I figured I would do something creative with it. :) If you can't indulge your whims as an artist, then where can you? It's kind of fun to compare this new piece with some of my earlier work. Here is a portrait I did of my friend, Autumn Macintosh, several years ago based on a photo I took of here looking out the window in Venice. "Autumn Meditation" 16x20 oil on canvas (original is sold). The two of these paintings are so different, but they are both about the imagination and childhood in many ways. 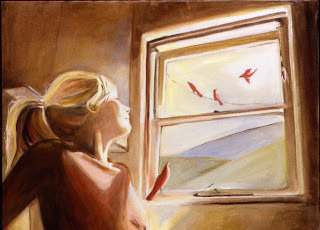 And, as in most of my paintings, there is an element of the surreal within the real. 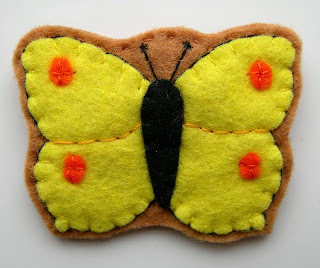 Thinking about butterflies today, I found these butterfly treasures by wonderful ETSY artists. How beautiful are these?? 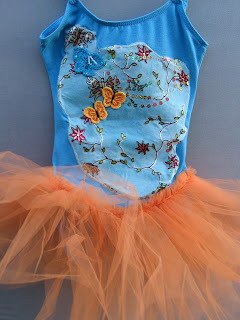 I've added a broader collection to my ETSY favorites, too, for all of you butterfly fans out there. 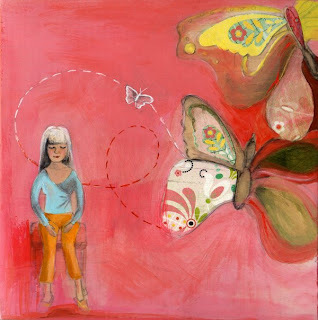 "Thoughts into Butterflies" 7.5x7.5 inch mixed media acrylic on wood. I had the idea for this painting yesterday, and it was one of those images that leapt to my mind fully formed. That happens sometimes, and I find that it always has a certain significance. For this one, I think that it has something to do with the very transformative time in which we're living. The banks are failing, people are losing their jobs, and every day reveals another ponzi-like scam of mammoth proportions. 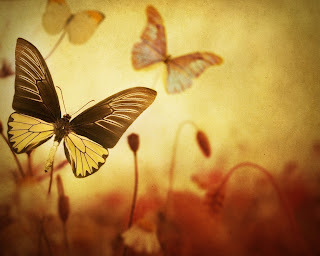 Yet despite this avalanche of bad news, it is also a time which can't help but initiate change, and hopefully rebirth. 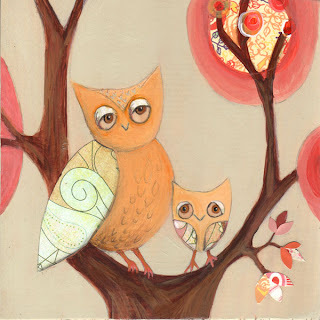 If 2008 was the year of the owl, then I hope that 2009 will be the time of the butterfly. 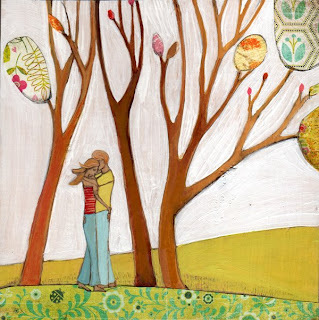 "Hug Day" 7x7 inch mixed media on wood. I'm very happy to share this new painting with you today --especially because I know how much most of us can use a hug right now if we've been watching the news (or even if we haven't). Sometimes a simple hug can feel like medicine to the soul. 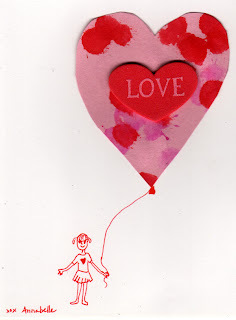 I'm sending you a hug right now wherever you are, whatever you are doing. Ta-da! They're finished. 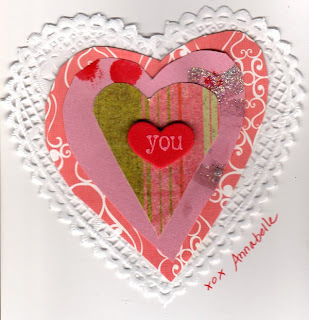 Today I transformed Annabelle's beautiful sheets of handmade paper into valentine cards. The one above is for her little brother who she probably loves more than everyone put together. As I survey our work, I kind of think I went a tad overboard, but this IS the first year that she's been able to even hold a tube of paint in order to make something, so I got very excited about our little collaborative project! 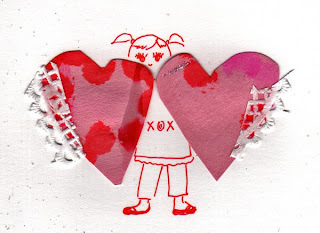 The best thing is that she really made the hearts herself, and she did such a great job. 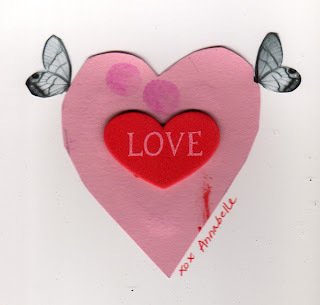 "LOVE" (4) 3x3 inch paintings on wood. Click here to buy original. 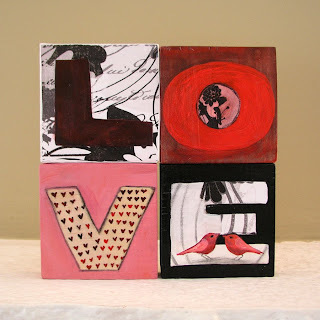 Anyway, I adored creating these pieces and love the fact that you can stack them, hang them or set them on any surface...infusing almost any spot with a nice dose of love! I promise to post some pictures of France soon. My favorite town that we visited was Senlis, and I took some beautiful photos there of this charming and romantic town.